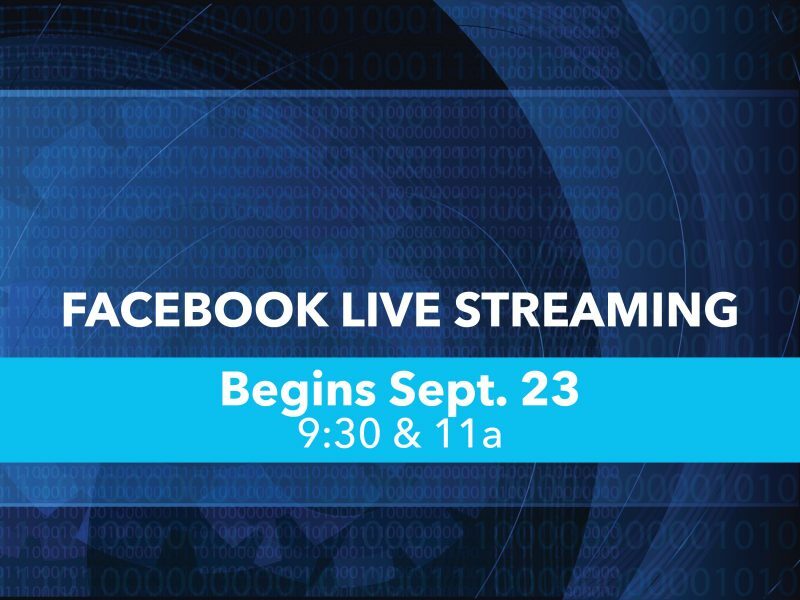 We are VERY excited to announce that we’ll soon be streaming our worship services on Facebook Live! Although I mentioned it in last week’s eblast, I’d like to give you some more background, and a bit about what we will be able to do. For three years, we’ve explored the capability of enabling people to connect to our varied worship services when they can’t be physically present. A survey of 280 members indicated that 70% would use this if it were available. Cost has been a factor because the traditional way of streaming would have involved a major investment in equipment as well as additional labor. You may recall this was one of our projects in the Unfinished stewardship initiative. Technology has now advanced and we’ve discovered that utilizing streaming video on Manchester UMC’s Facebook page will enable us to present our worship online for minimal cost. Through special gifts and endowed resources, we’re blessed to begin this new ministry on Sunday, September 23. Both the 9:30 and 11 a.m. services will be streamed. To use this service, you must “Like” and/or “Follow” Manchester UMC on Facebook. (Once on our page, click the “Like” or “Follow” button(s) underneath our cover photo). You’ll automatically receive notices through Facebook when the service is about to start. To make Facebook Live happen, we have an opportunity for an extra person in our audio/visual booth on Sundays. We want to develop a team of rotating volunteers, trained by our A/V Coordinator Brian Gagliano. You will not only enable our worship to literally reach around the world, but you’ll be having a great time with great people! For more info, and to make Brian’s day, email him. I hope you join me in the excitement of how this will touch people’s lives, as well as in the appreciation we all owe our dedicated staff in making it possible. I hope you’re enjoying, along with me, the opportunity to explore the Bible from different perspectives during this series. This Sunday (Sept. 2), in all morning services, I’ll be preaching on “What The Bible Is/Isn’t: A Kingdom Book, Not a Political Book.” It’s based on an interesting passage of Scripture: 1 Samuel 8:10-22. If you’ve missed either of the first two sermons in the series, you can view them online. Will You Twist the Night Away with Me? If you understand the meaning of the above headline, then you’ll want to join me for the Senior Night on Friday, September 14, 6 p.m. I love it that we are intentional about fellowship events for all ages. So, for those who twisted the night away in their youth, come twist the evening away on the 14th! Tickets are available online for $6 each in advance, or $10 at the door. Next: Next post: Wednesday Meals Makeover!